In August of last year I bought a kit from a store and my bonsai has been growing wonderfully since then. But recently, I believe around December, it started to die. Right now about half of its...I guess branches are dry and withered while the others are green. It's a Japanese black pine. I've been watering it the same as I have been since I bought it. Though I'm afraid there was a time where I neglected it for a little and I'm worried that it's the reason it's dying. My mom thinks that giving it a little more soil will help, since the soil the kit came with, seems to be insufficient. She also thinks vitamins will help. If anyone has any tips please let me know. Thank you! So much more information is needed here. You say 'kit'. Did you start this tree from seed? If so, when did it germinate? Where are you keeping it? Do you know that Japanese Black Pine is very definitely an outdoor tree? Please 'google it', and do some research about pine trees in general. Post some pictures if you can. All the info you give us will help us identify your problem. Oh so sorry! I'll try to answer your questions to the best of my ability! Kit, yes. It came with a pack of 4 seeds, soil, a pot, scissors and rocks. The first seed that germinated got eaten by a bird So I put another seed and I think this one germinated maybe...a month after I planted it? Around that time. I move it outside in the morning and inside at night. And since I live somewhere where the sun is pretty intense in the afternoons I've been trying to move it into some shade around 2 pm. My mom thought it would help to try and cut the dead parts off. I'm not sure if that helps or not. 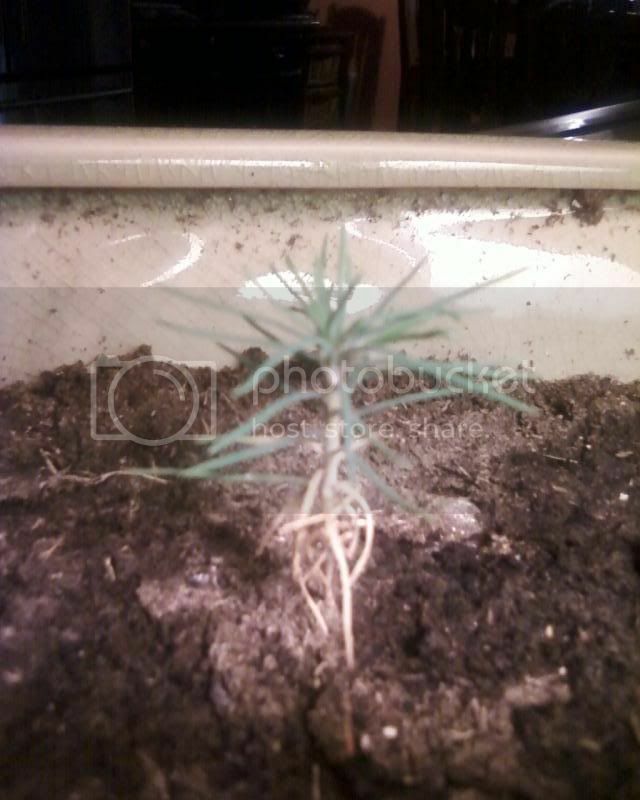 What you have here is a young seedling - not a bonsai, at least not yet. You are doing well so far. I hope that we can get some others with more experience with seed starting, of pine in particular, to give advice. Pines are known as slow growers. Yours is probably doing OK for starters. Does the pot have drainage holes. That is very important. Young roots do not want to be constantly wet. It is healthy roots that you need to be most concerned with at the start. Without healthy roots you cannot grow a healthy plant. The early branches that have died off can be left for now - they do no harm. The top looks to be alive and well. You might want to add a bit more soil around the trunk and add some support to the tree to secure it as any outdoor wind can cause it to move around a bit which could loosen soil and tear tiny roots. Use 2 or 3 chopsticks positioned around the tree and loop some string (very carefully) around the pine and sticks. Lastly - do not let it sit in the hot Texas sun. Find a spot where you have filtered shade. Bright but not full sun. Your soil should never be soggy wet nor too dry. Watering when needed, and allowed to dry a little for a cycle of both moisture and air for the roots. Air circulation is also a plus. Learn about basic bonsai care. One key element is PATIENCE. It will take years, ....yes years. You are off to a very nice start. I hope that you enjoy the journey, and can one day be proud of your first little pine. Please spend some time reading about what bonsai is. Thank you so much for your help! And yes I know it's a bonsai but just a seedling right now. It didn't occur to me to actually state the stage it's in for some reason. I've looked up bonsai care but for some reason I only find rather basic information. I'll try to look around more though. Thank you again! I'm not a bonsai grower, but I never heard of watering anything three times a day! Are you giving it enough water when you do? I think you want to water thoroughly (until water runs out the bottom, or by submerging the pot) but less often. Three waterings a day is excessive. The most I water any of my plants is 3 times a week, except in the heat of summer. Water only as needed. We still haven't heard whether this pot has proper drainage holes. Basic bonsai care is what I suggested reading - not advanced. It is still a very young seedling. Start at the beginning. Well I just give it water when the soil is dry. I've been doing that since I planted it and it's been just fine up till recently. I never thought my watering would be a problem if it hasn't been a problem before. And sorry sir, I seemed to have forgotten to answer that. Yes it has drainage holes. i don't like the fact it gets moved everyday, trees don't like to be moved. Try finding a good spot where it gets just enough sun and shade for your area. For the sake of the little guy, no more "3 times a day" waterings. I think any gardener can attest to that. When you say you "just give it water when the soil is dry", do you mean the top layer of soil, or do you check below the surface for moisture as well? It's okay if your top layer gets dry. Too much water can lead to roots being starved of oxygen, which in turn leads to root rot, and you don't want that. Just because the pot has drainage holes doesn't mean you should give it that many waterings in one day. Watering should not be a routine schedule either. Only water when needed. I usually water mine (in the morning) once or twice a week. The thing is, I've been watering it like that since I've planted it back in...I think September. But alright. And it doesn't really have much soil. If you stick your finger in a little you already hit the rocks beneath it. It's how much the kit came with. As for location. I promise you there is no location in my back yard that gets sun and then shade. My backyard is on an awkward hill. Earlier today I tried putting a fire pit cover we have above it and the a towel on top to try and not let the Texas sun hit it so much. Maybe, technically you could leave it in the small pot, but it would take YEARS (or decades) longer and be way harder to keep alive. A larger pot will provide a more stable environment for your tree roots and shoul help it be happier. Ah thank you very much. I figured the size of the post was ok since it still looks quite small and the pot seems to be about...almost a foot wide and...maybe half a foot...well in the other direction (goodness I'm so tired that I can't even remember basic geometric terms! haha). So maybe that's still big enough for it? And yes it came with little soil disks which we broke apart but it didn't seem enough. So recently we bought the smallest bag of soil we could find and we put a little hoping it would help. As of now it's on a windowsill that gets quite a bit of sunlight. Still worried about the sun. And I watered it today after a few days of not watering it. People were telling me to refrain from watering it so much which I've been trying. We've also bought distilled water hoping that will help. I'll probably get scolded from members for using tap water but I've been using tap water since about August and there hasn't been any trouble.